I've been delinquent from our local Quilt Group for so many meetings. It seems something comes up either at the last moment, I'm too tired after work, or I just plain forget. So I really made an effort to get there this time, even though it was tough. And it was great. 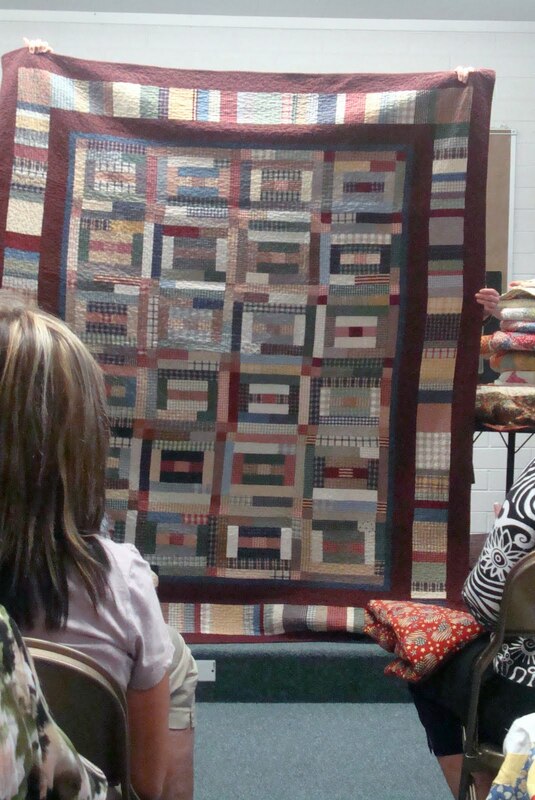 I was happy to see friends and get a dose of quilt injection. We always have show-n-tell first. 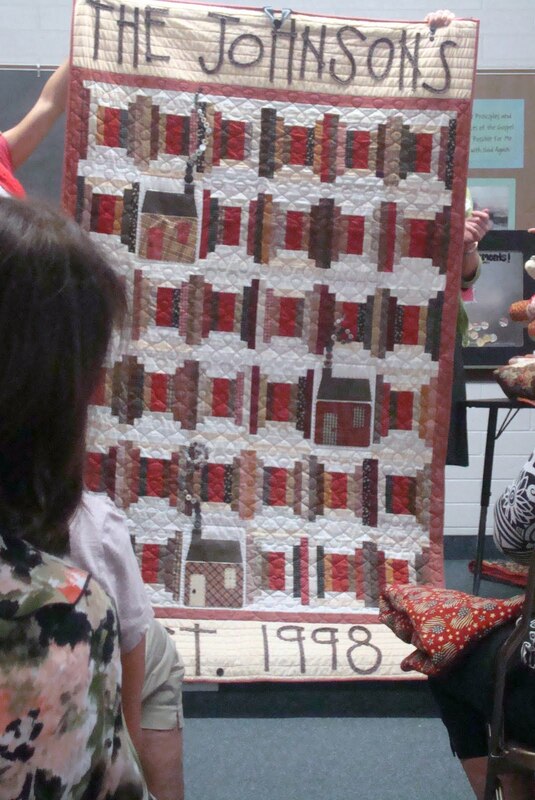 So these first quilts were from group members. Love the flag. A Jan Patek design in lovely dark colors. 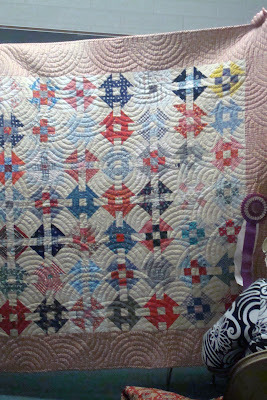 Embroidery placed in a quilt. 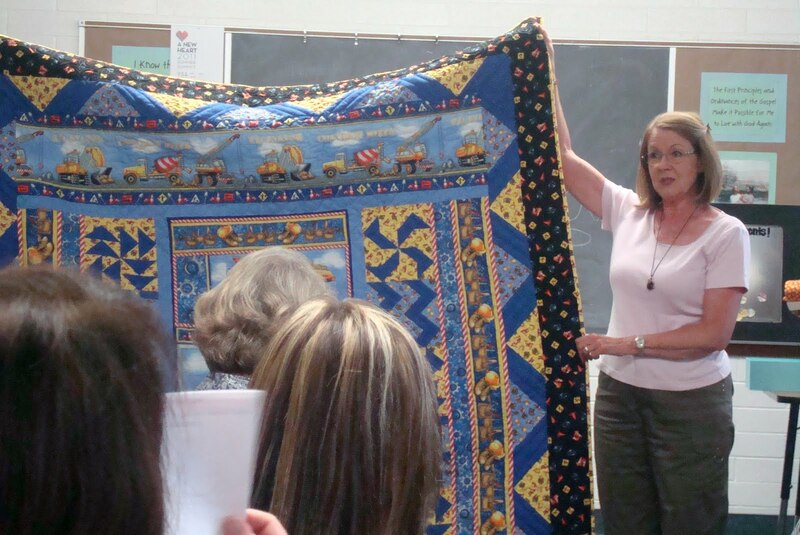 A quilt made with hopes to inspire a boy baby. Love this "Going to Market" quilt. 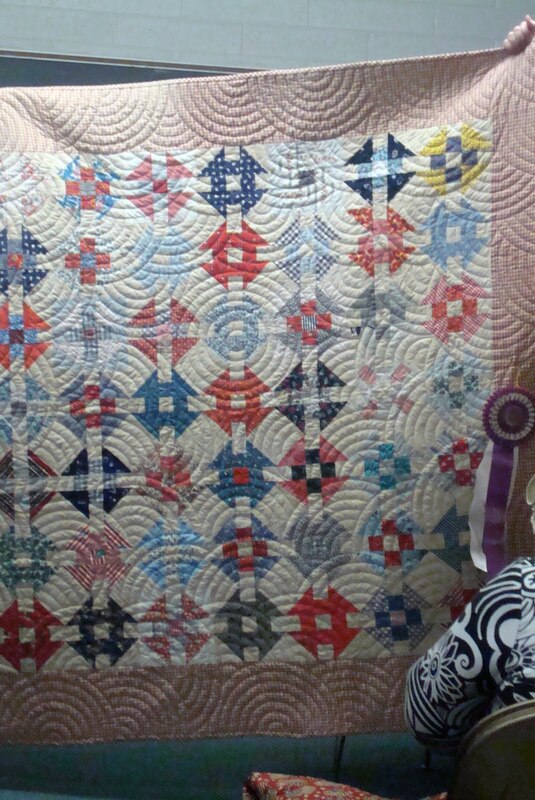 A favorite pattern. 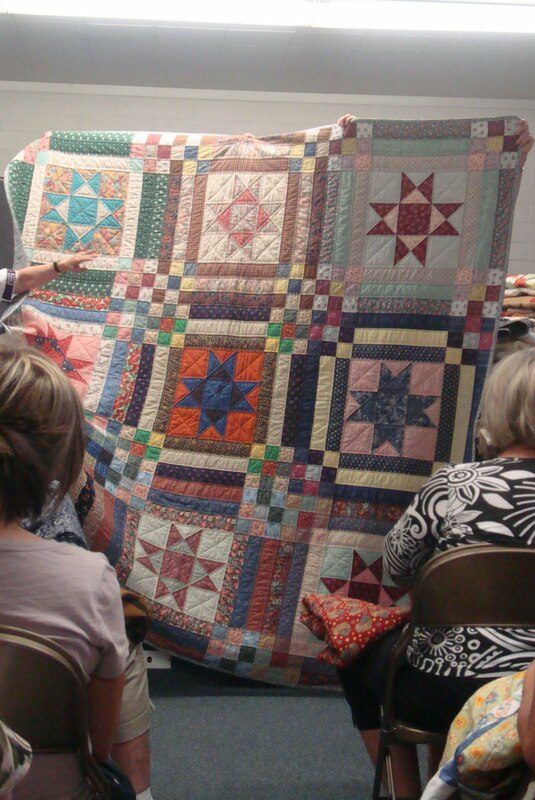 Melissa's quilt. Monkey wrench I think? Not sure. Looks hard. 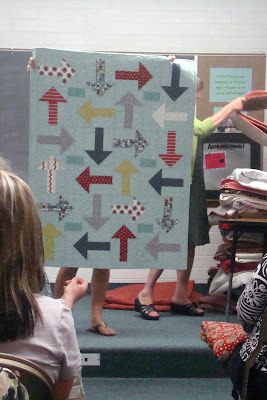 Another Aniva flimsy ready for quilting. Amber from A Little Bit Biased and her grandmother GiGi presented our trunk show. Amber's quilt pattern company is named after her grandmother. GiGi started out the show. GiGi lived in Hawaii for 25 years and was the president of the LQG for a few years. 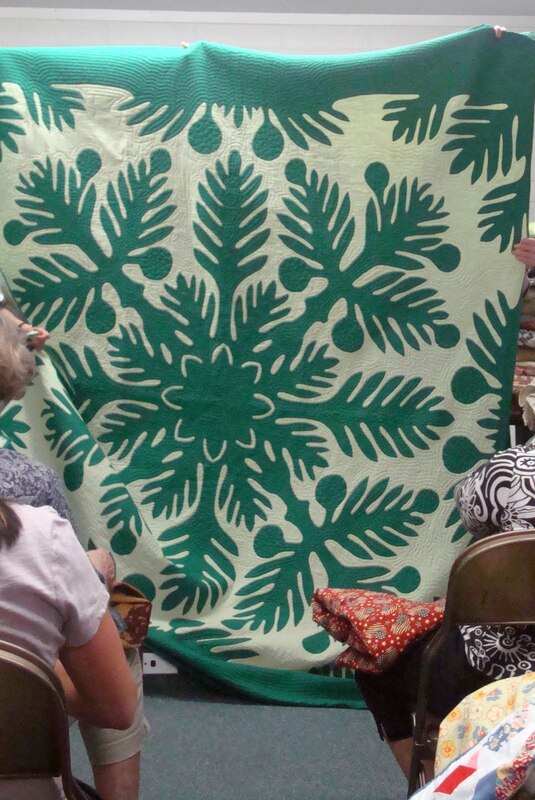 She made this wonderful Hawaiian quilt. Fabulous! She has been featured in a quilt magazine. 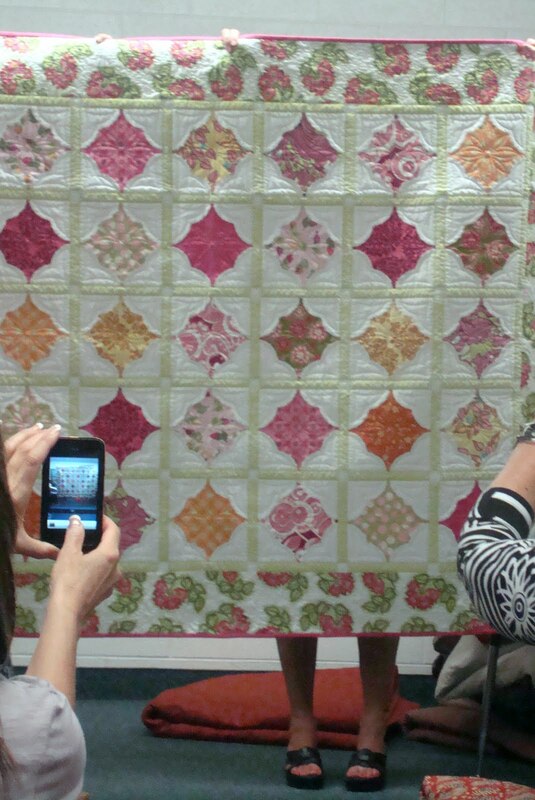 And her quilts are ALL HAND QUILTED! 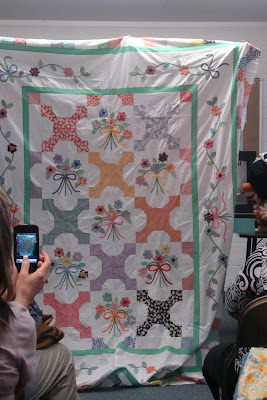 This was my favorite from the show of GiGi's. 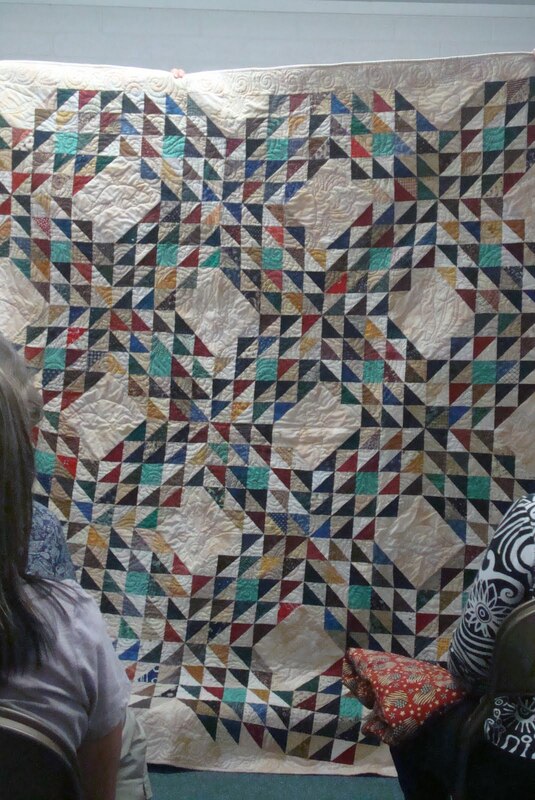 Look at that hand quilting. It makes the whole design pop. The motion is wonderful. 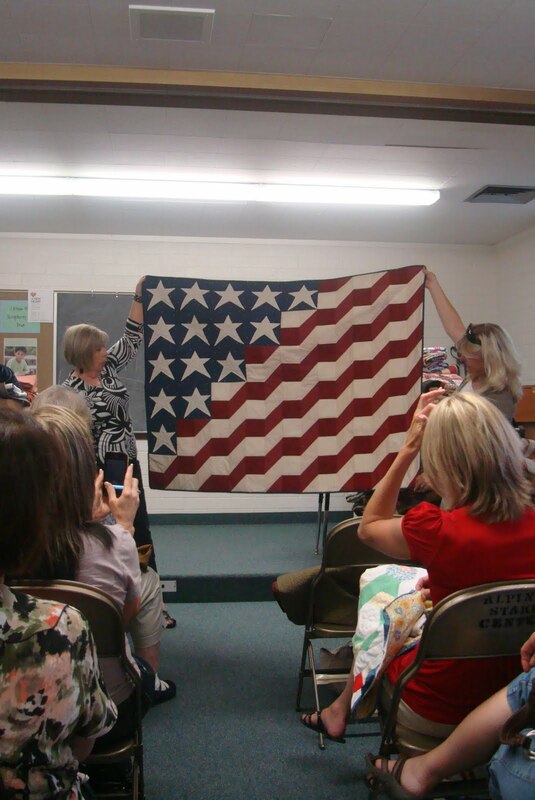 No wonder it was a winner at the Springville Quilt Show. 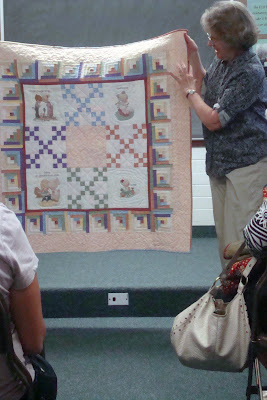 Amber was next and showed us some of her quilts. Amber lives in Alpine and has a cute family and works at the LQS, Just Sew. This quilt used all dot fabrics. This is Amber's first quilt made with GiGi's help. This is a flimsy of GiGi's. I was talking (my bad) so I didn't hear everything but isn't this amazing. 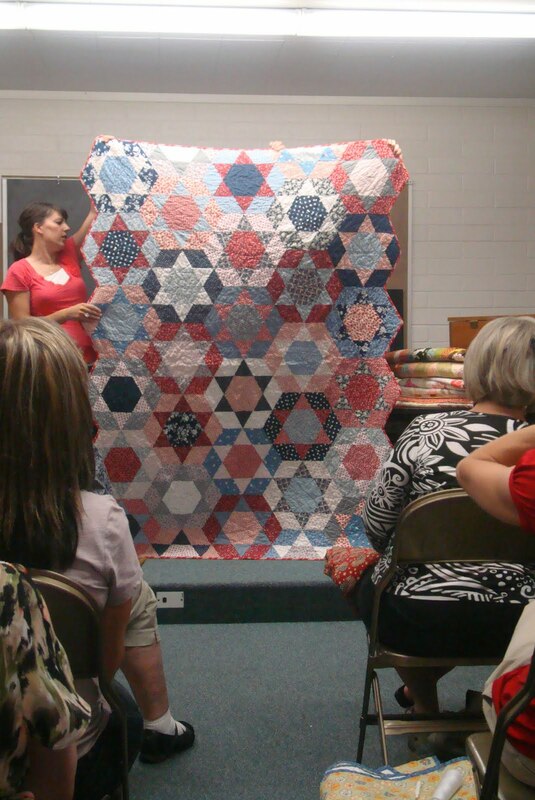 Amber and GiGi have similar quilts made like this. 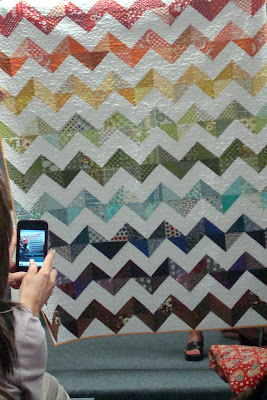 This is Amber's zig-zag quilt. Also a rainbow. 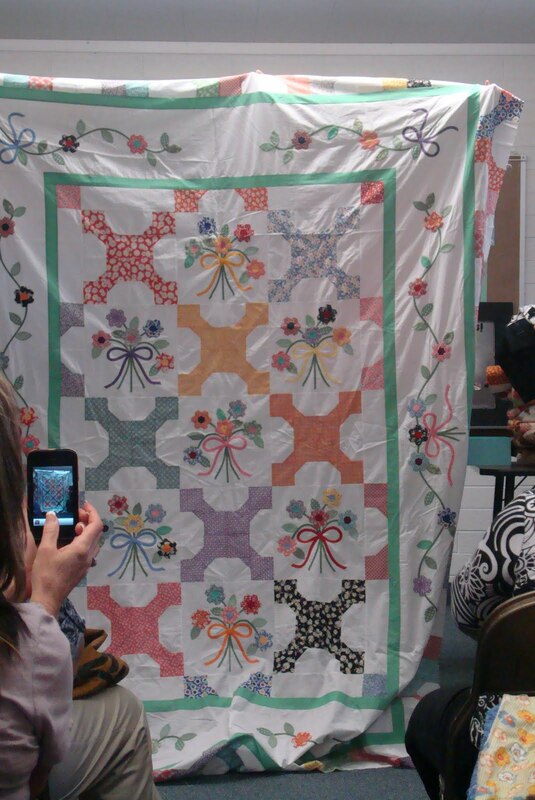 Sweet quilt by Amber and I was negligent in my photo taking. You can see I sat in the middle/back. But Amber is far right with white shirt. 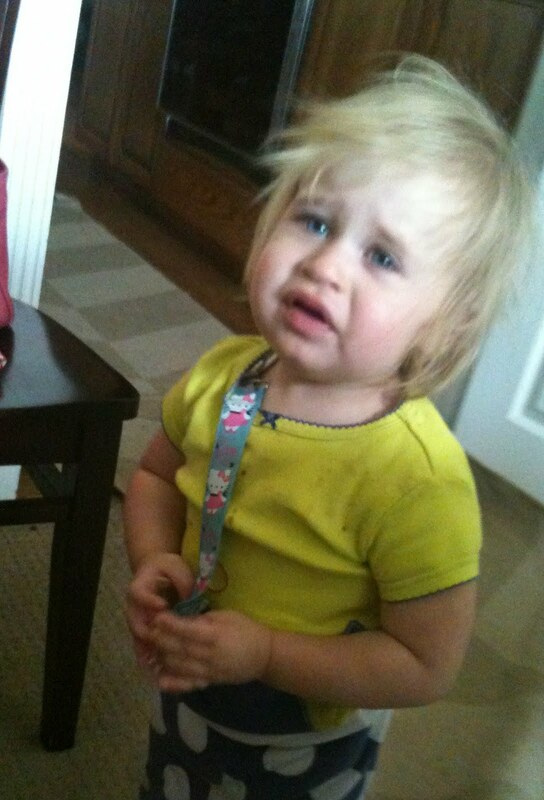 She's a cutie. Love the tight snow balls from Amber. This is a pattern of Amber's made in this colorway. 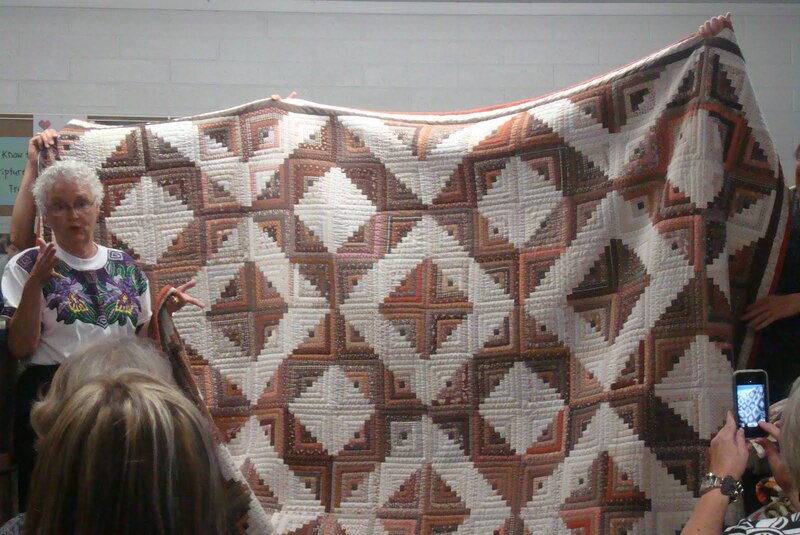 And then made in this colorway. Both beautiful. 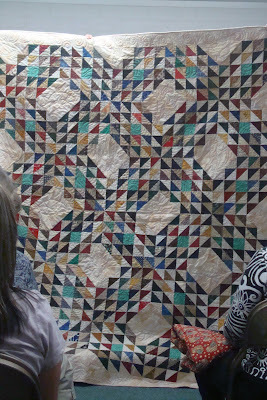 I really like this wall hanging. It is so cute and the fabric enhances the pattern. It is an Amber design. 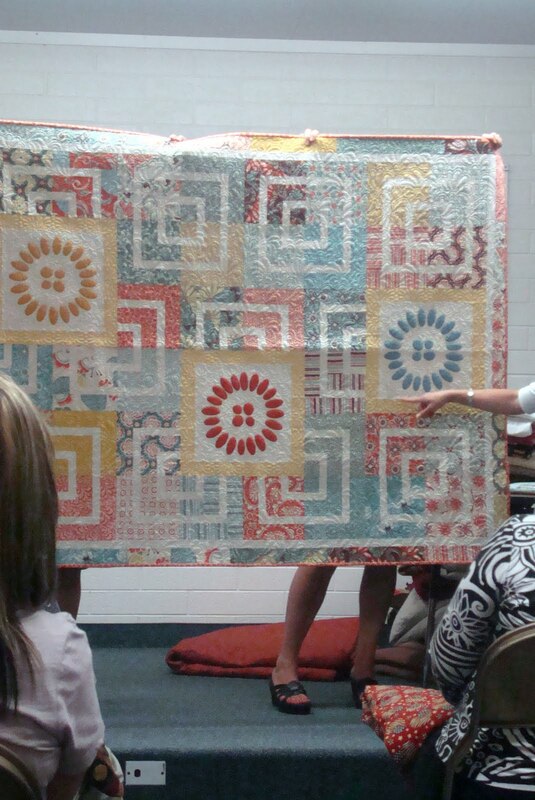 Another quilt and pattern by Amber. Love love this one. 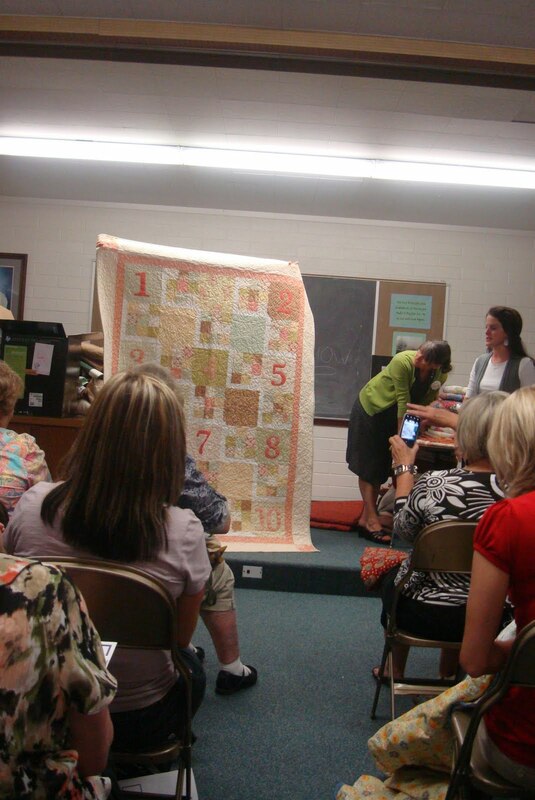 Another Amber quilt and a pattern. And another Amber design. Looks hard but worth it. This is my favorite quilt of Amber's. 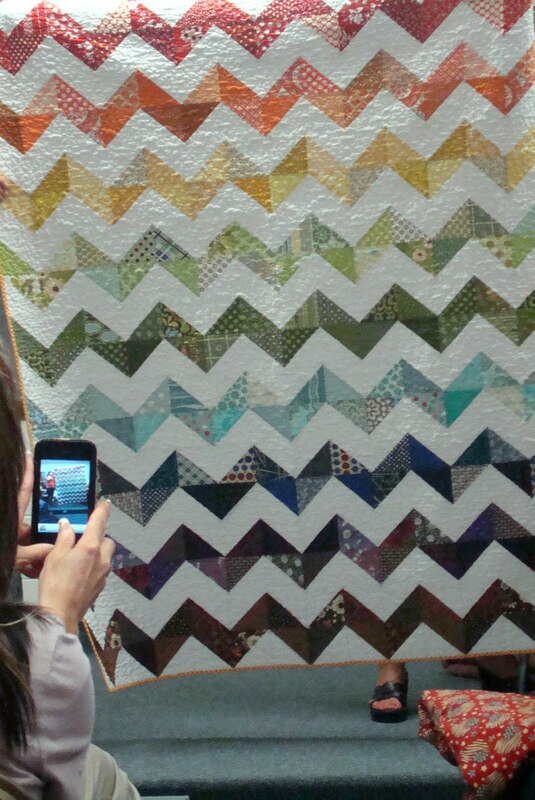 When I went to Quilt Market and visited Amber in her booth I decided I wanted to make this quilt for a boy grandson/grandnephew when and if that happens. And if not, I'll make it anyway. 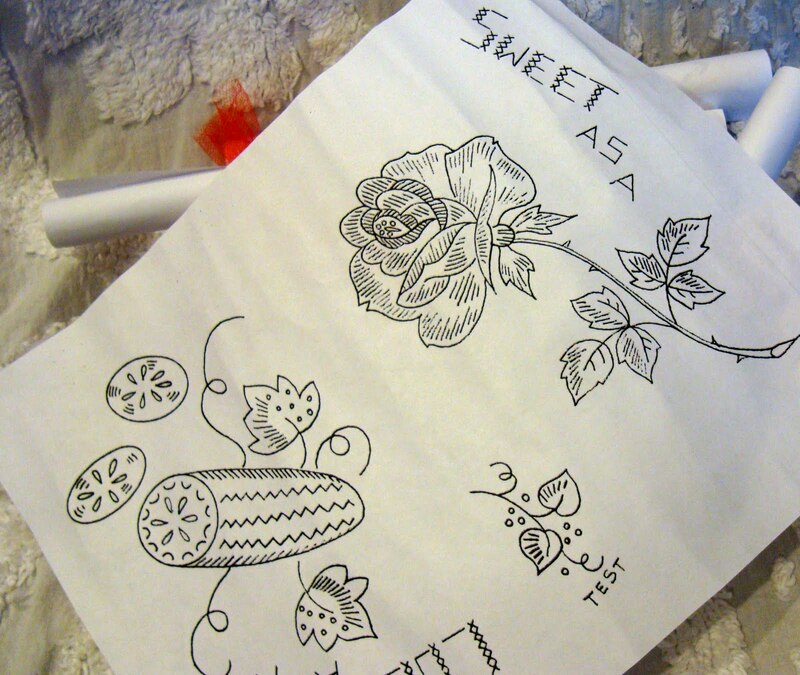 At the end of the night Amber had a drawing for free patterns. And guess what?! My name was called first. I was lucky enough to get my 3 favorite Amber pattern designs. I really love them. Fabulous. Thanks so much Amber. Loved the trunk show from GiGi and Amber. 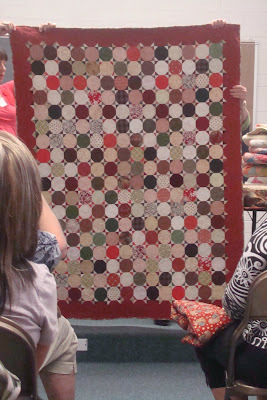 Cindy from Riley Blake fabrics was there with the wonderful Riley Blake bike and I was lucky enough to get a Roly Poly of the really cute Christmas Fabric called Christmas Candy. Lucky me. It is July and time to think of Christmas, right? 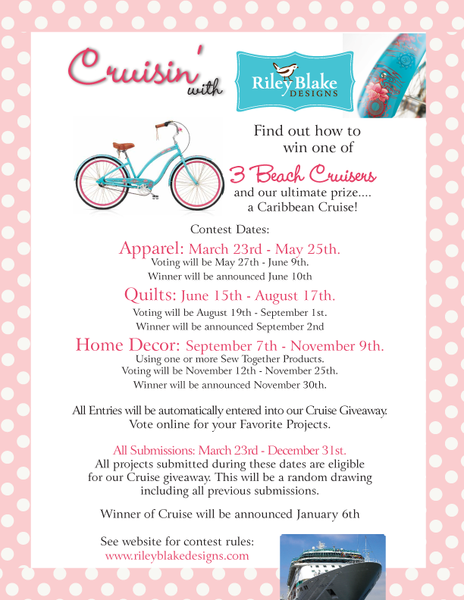 Cindy told our group about the contest going on at Riley Blake for great prizes including the cute bike. Contest rules are here. All you have to do is submit a photo with your favorite quilt made from Riley Blake fabric. 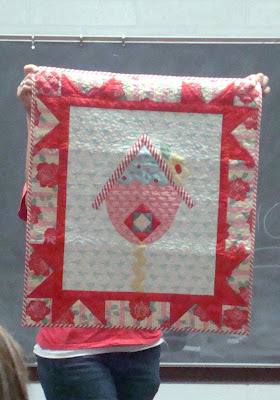 I have got to finish Lori's Cherry Cheesecake quilt so I can enter! I am sure I will make the deadline. 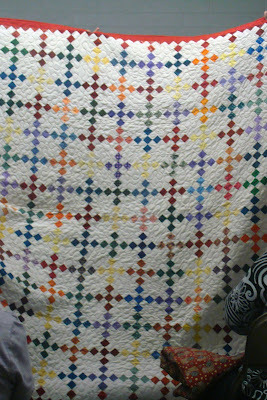 Speaking of my quilt...I gotta go work on appliqueing those daisies. Have a great day. With increasing cost of fabric and materials along with counting my precious time, I've sometimes thought, "should I make this or buy this?" when I see something I feel I want or need. At Quilt Market Lori Holt had the cutest vinyl shopping bag and I asked her where she got it. She bought it at the check out for $1.00 at TJ Maxx. 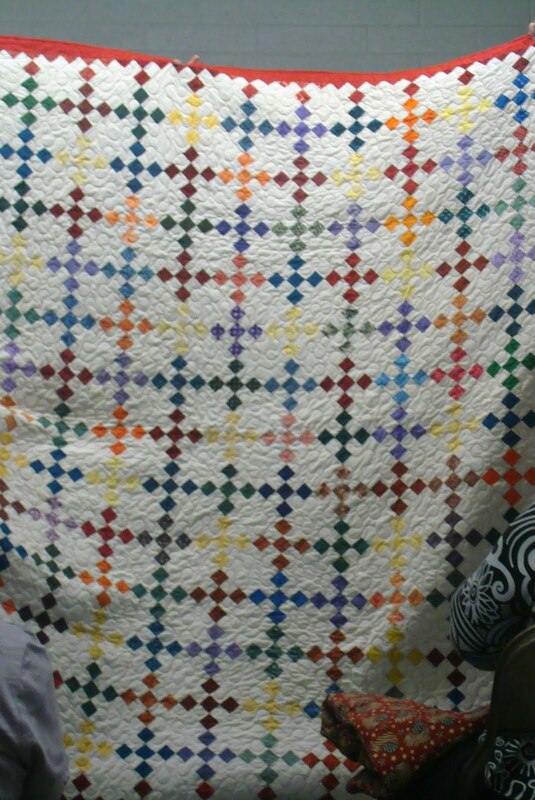 It was kind of a patchwork pattern vinyl and so cute, especially at that price. 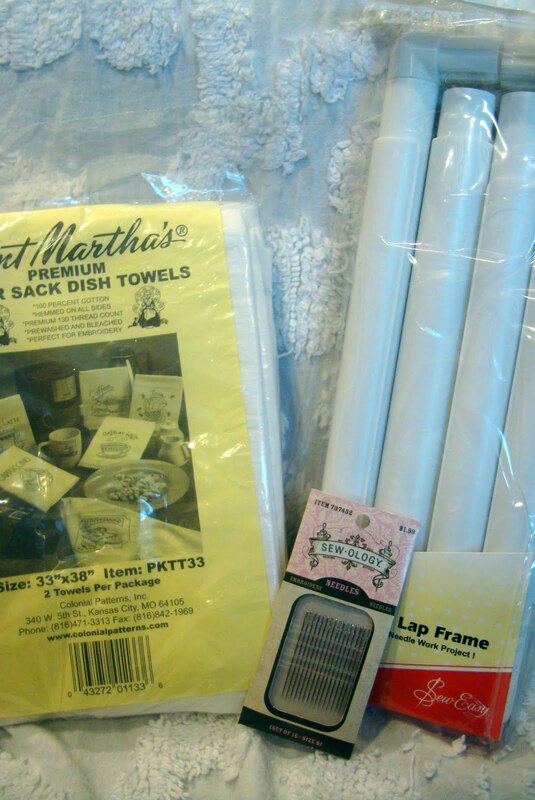 When I had some time I went to TJ Maxx and at the check-out area I looked for Lori's vinyl bag. Of course they were out of stock. But they had some similar vinyl bags in other patterns. Again, for $1.00, how could you go wrong? So I picked up a couple bags and have used them for shopping and moving things from place to place. I don't know if you realize but oil cloth and vinyl coated fabric is becoming more and more popular. 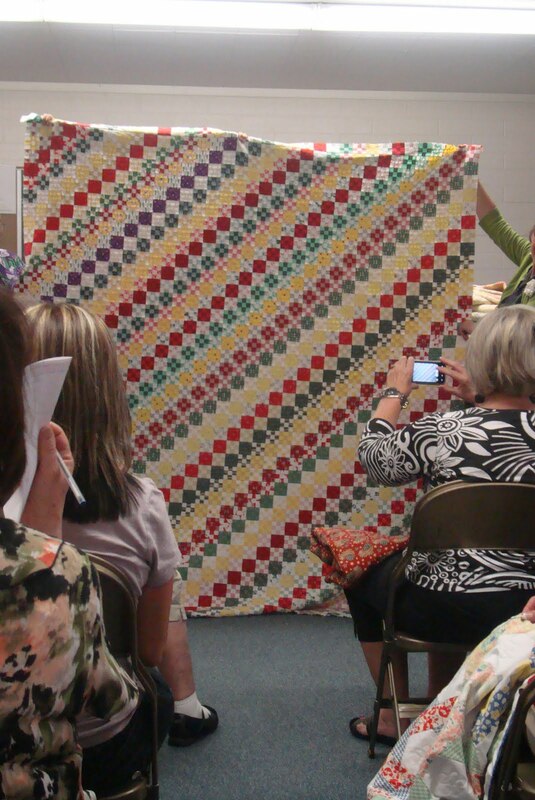 In fact, your favorite fabric is likely out or coming in in a vinyl covered version. 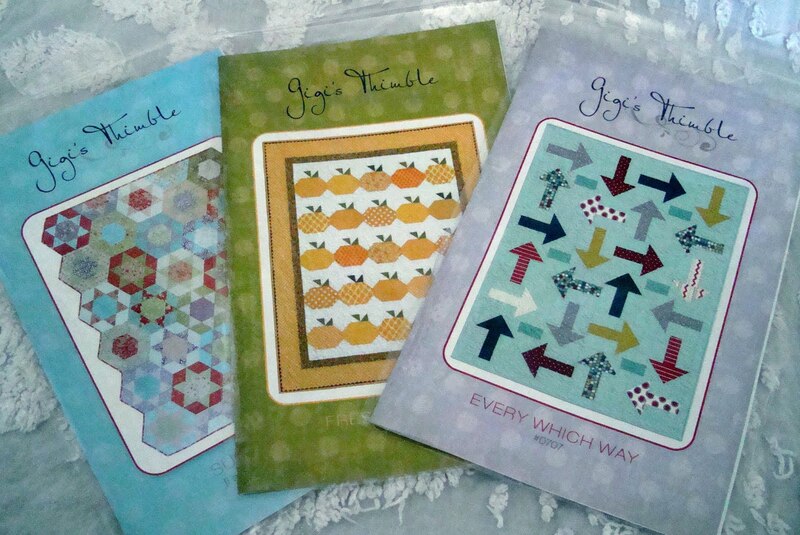 Jennifer Paganelli has some really cute vinyl covered fabric out right now. 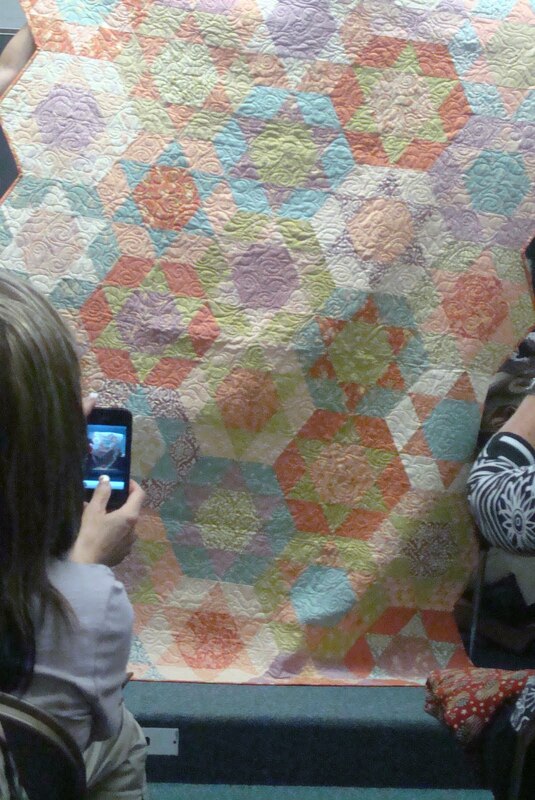 All the cool designers are doing it. Riley Blake is coming out with their best lines in a vinyl version. 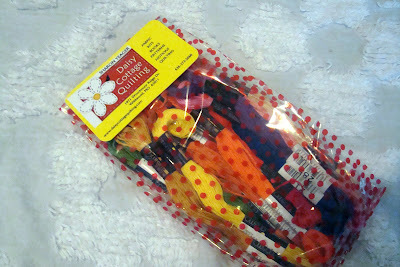 So I've been thinking I want to use some of that laminated fabric and make some bags. I actually have some laminated fabric and oil cloth I hadn't used on hand. 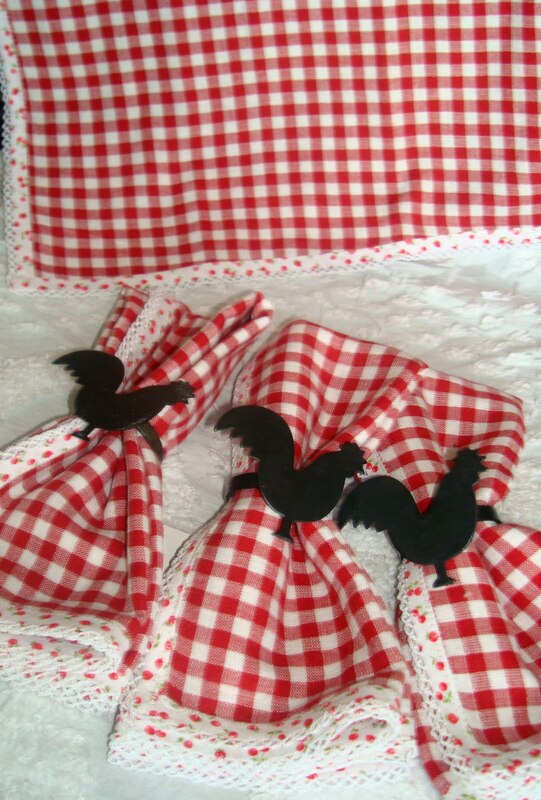 I thought, why not make a shopping bag. And I did. But it was more work than I thought it would be. Anytime I make something new or different it always takes me longer than I think. I purchased cotton webbing for the handles since I really don't like how the synthetic webbing feels on my hands. You can find that on etsy or a google search. 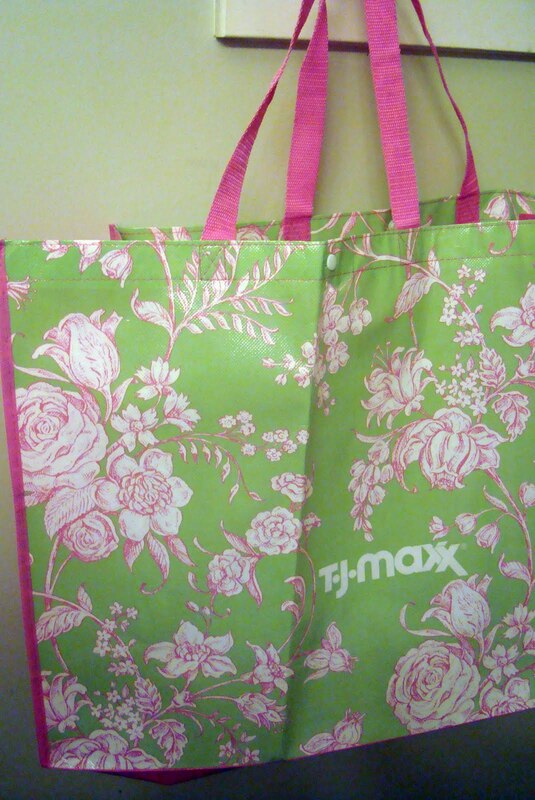 And the handles on the TJ Maxx bag were too long. Making a bag let me customize the handles. Of course I think mine is more stylish than the purchased bag. 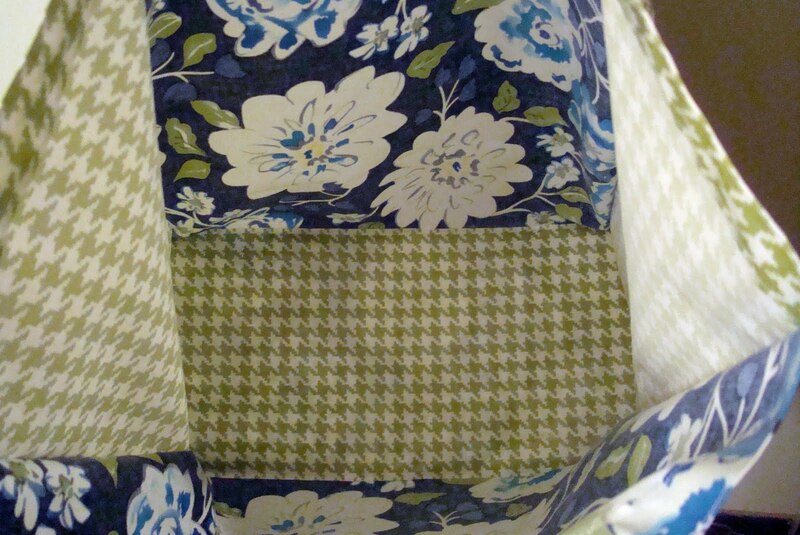 I used several different patterns and pattern ideas to make my bag and didn't follow 1 single pattern. 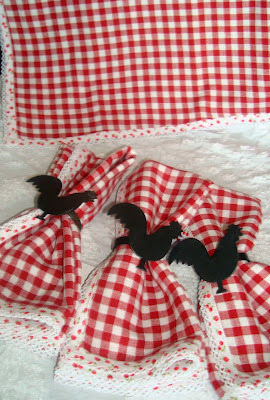 I had purchased an oilcloth bag pattern but all I really used from that was the size and the idea to baste seams with applique glue. I created the bottom (with heavy duty interfacing) my own way and constructed it in a similar method to other tote bags I've made. This bag is not lined however, obviously. I had this premade decorative seam binding for a while now and I've been wanting to use it. I like the accent and how it is similar but different than the bag materials. And of course I really like the green hounds tooth on the sides of the bag. I will make more similar laminated bags. After all, Lori has laminated fabric coming out and I will want to use that. 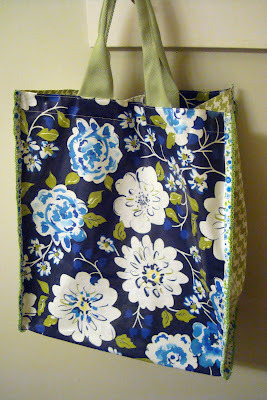 Next time though, I'll change some things and I think it won't take as long to make my own shopping tote. But, a few $1.00 bags from TJ Maxx can't be a bad thing to have around. 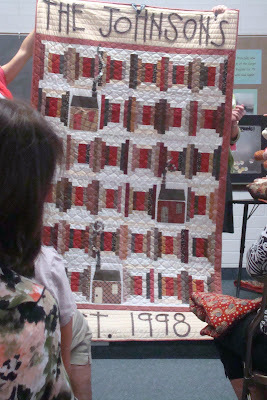 When I was at spring Quilt Market I met lots of fabulous quilters and blog friends. One of them was sweet and talented Sharon, formerly of Red Geranium Cottage and now of Daisy Cottage Quilting. 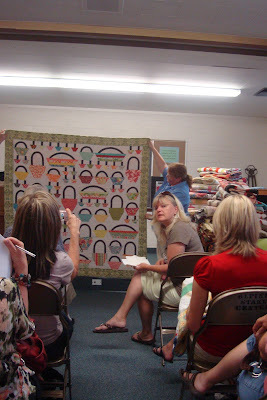 Sharon is loads of fun and those of you familiar with her blog already know that. Sharon has some great things at her new store. One thing that I really like is this Lecien yarn died fabric. It is like homespun fabric only fabulous. It is smooth and soft and has no wrong side. 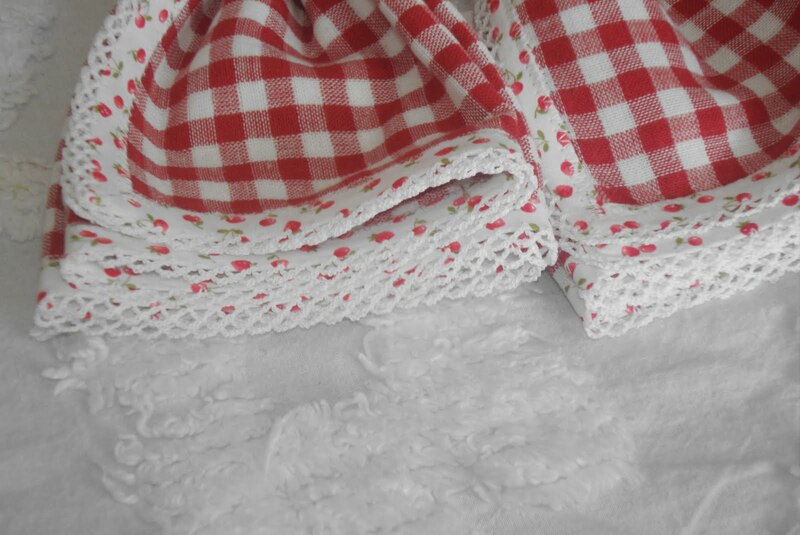 It is great for making little kitchen towels, embroidering and just where you don't want a wrong side to show. It really works great for any project. 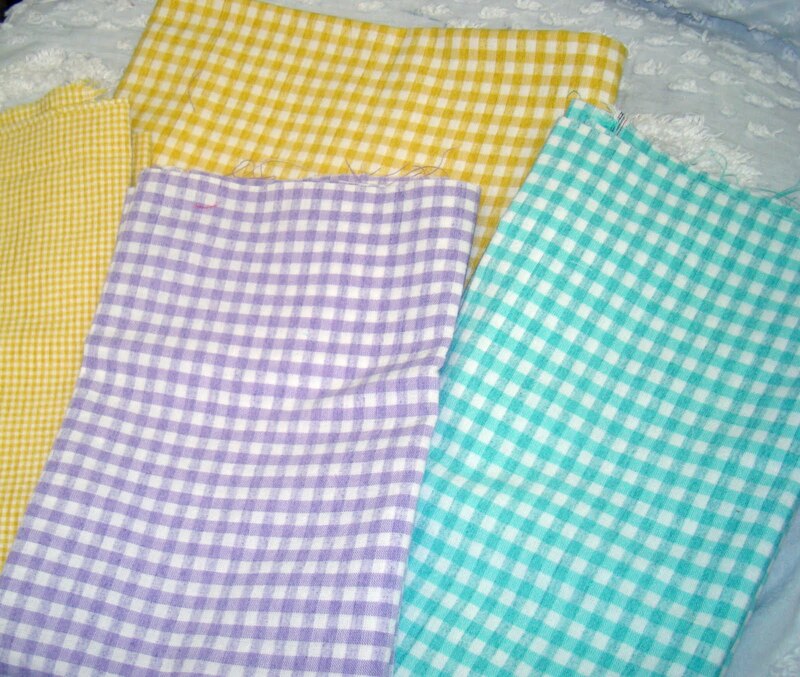 I needed some yellow yarn dyed and Sharon sent me this beautiful set of fabrics in delicious colors. Thanks Sharon. I also expressed interest in some embroidery thread since this is going to be my hobby away from quilting (I've decided). 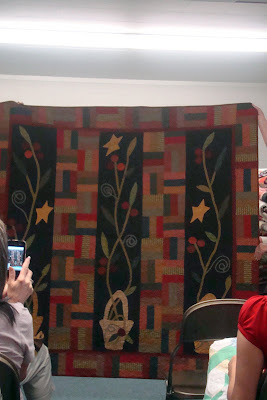 I really am lousy at embroidery but one of my sewing room goals for 2011 was to make stitch embroidery projects and get better. 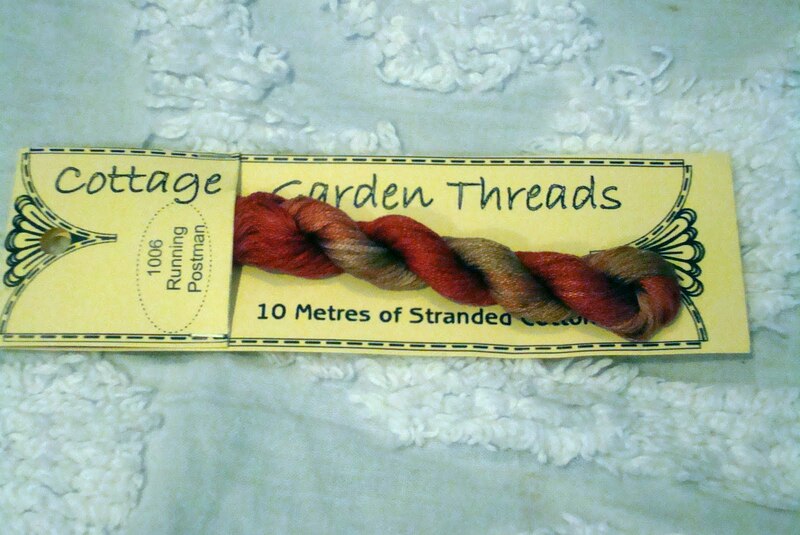 Sharon sent me this really lovely buttery embroidery floss/thread imported from Australia. Don't those Aussies do the best embroidery! I'm excited to use this. Thanks so much Sharon. I believe in good tools. And this Cosmo thread is going to be a great embroidery tool when I get going, right!? Nice colors and it is such good quality. This is not your grandmother's floss. 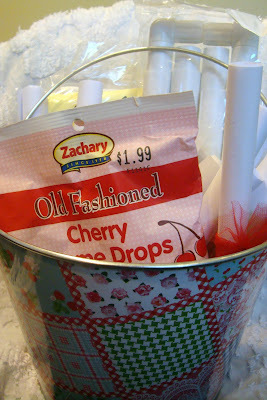 Little did I know when I started dreaming of my new embroidery hobby that Lori had a custom giftie for me. Look how cute that bucket is. It is a beautiful bucket full of my new embroidery hobby. Lori thought of everything. She is a queen of embroidery. 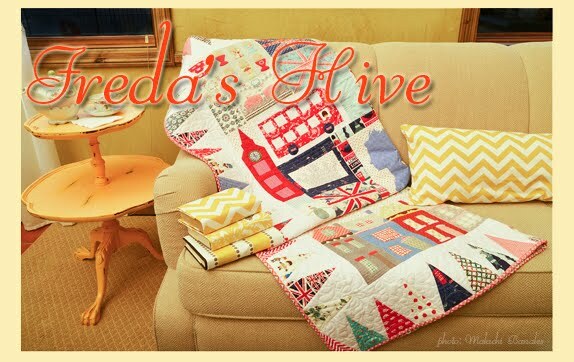 She put in her favorite flour sack towels, her favorite frame and her favorite needles. A perfect marriage for my new perfect floss. 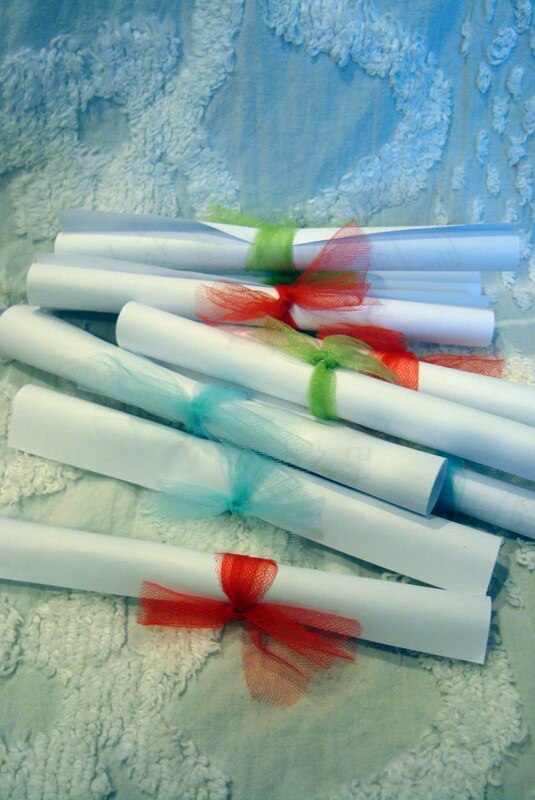 In the bucket were these rolled up papers. I won't unroll all of them to show you but they are vintage embroidery patterns ready for me to trace and make. 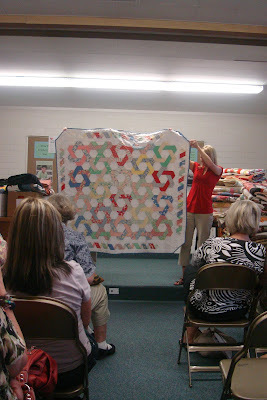 I can stitch kitchen towels or even turn the patterns into quilt blocks. Thanks so much Lori. I'm really excited to build my stitching skills. 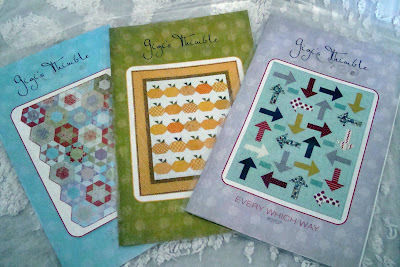 I have a little book of stitching directions I can tuck into my on the go bucket. Fun. Now for some Allison time. My friend Diane, who has her own super cute little grand-toddler, was saying I could up my nanny brag level on the blog. So here goes. 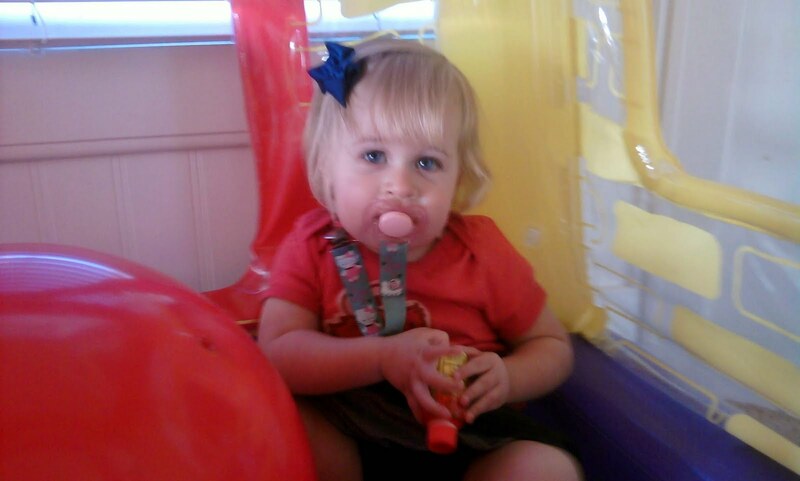 She's in her ball pit that Aunt Tracey gave her looking deceptively tame. Allison in a moment of angst. Toddlers lead the most stressful lives. Oh I know how to spoil her. However, she started eating it from the cone side right after taking this photo. 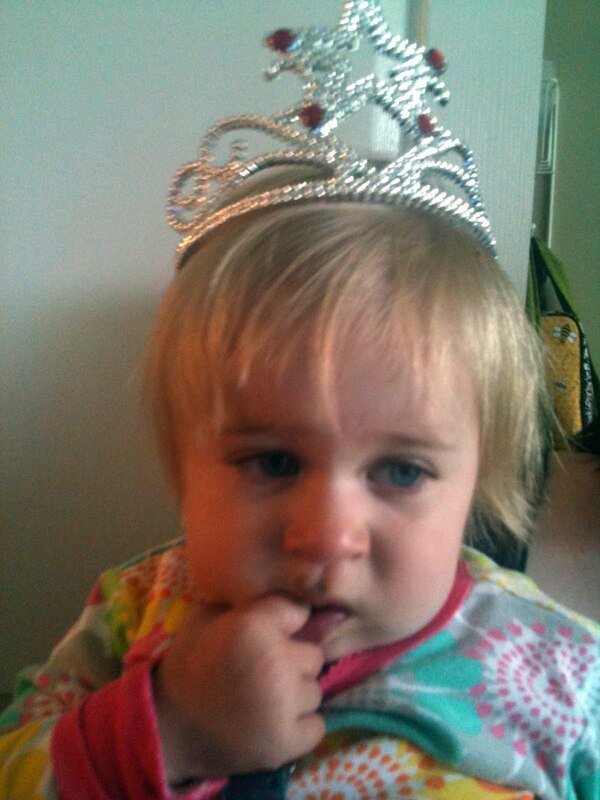 And she's our little dirty faced princess. That is the life of a toddler. Your face is always dirty but everyone is there to spoil and give you attention. 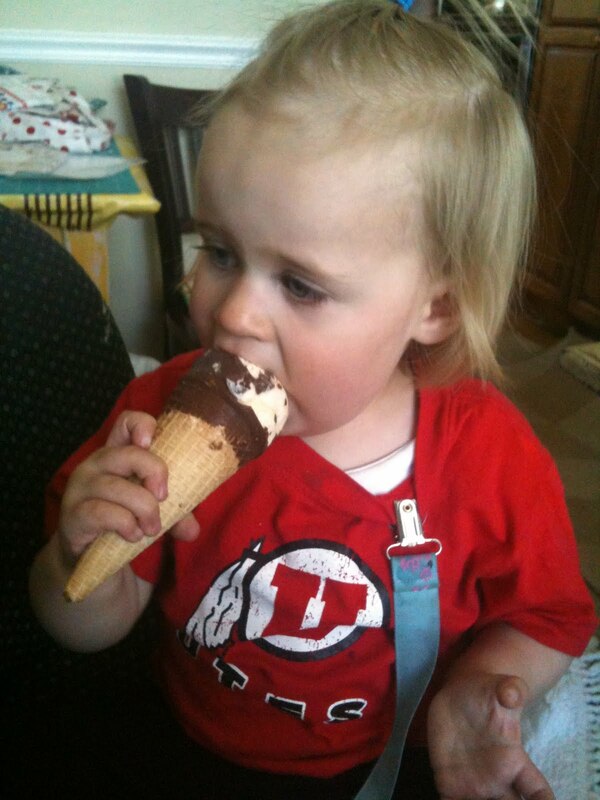 Life is good when you are 21 months old. I've been a Rowenta iron gal for about 12+ years. I started with a really nice Rowenta my SIL gave me for my birthday. 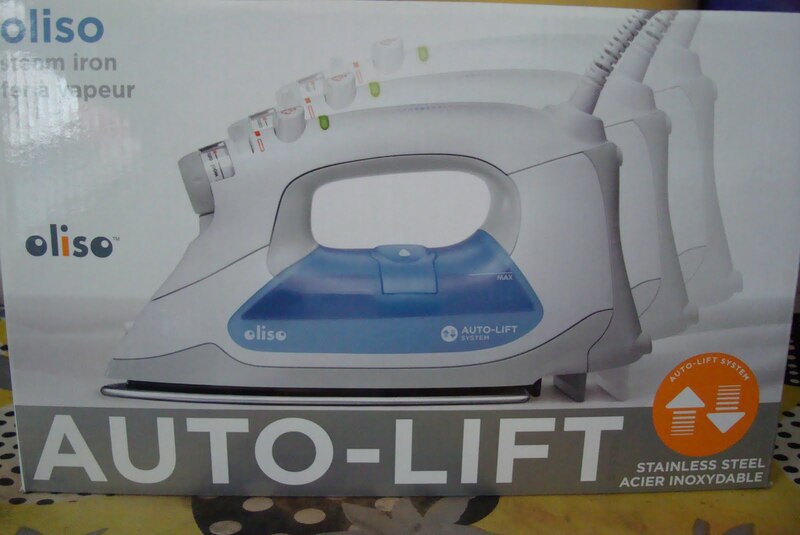 It was a steam generator iron, nice but pricey. It lasted quite a while with alot of abuse but after about 5-6 years it got a huge hole in the water well after one bad fall. And although I loved the well of water and ready steam, it was too big for me to use on my smaller ironing board in my sewing room. So, I chose to replace it with a smaller Rowenta. I always have 2 irons/boards being used. 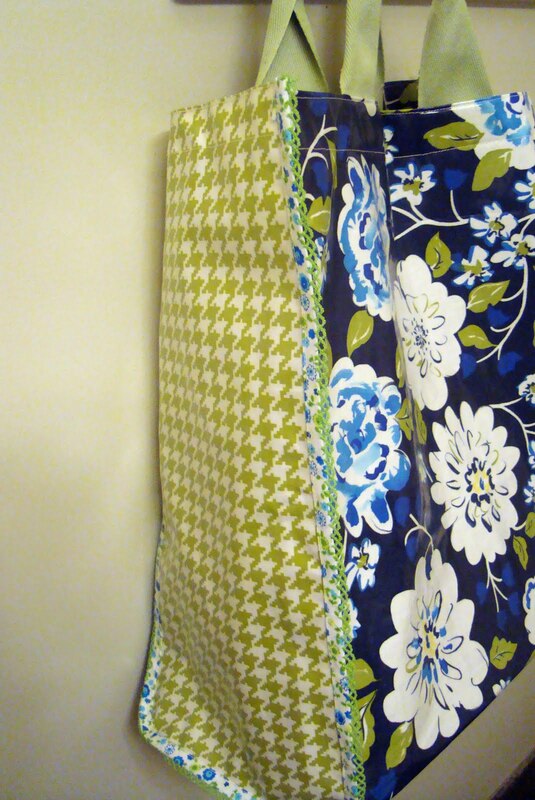 One for the family to iron clothes and 1 in my sewing room. So over the years I've probably gone through about 5 Rowenta irons. I am kind of hard on irons. Right now family Rowenta iron is starting to spit a little but we are dealing with it and using it anyway. However, my sewing room iron (the most crutial) completely stopped working while stunt sewing for Lori just days before Quilt Market. I cannot go without a good iron next to my machine. Most of us have seen that Yellow Oliso iron on Fons and Porter's TV show. It is pretty beautiful. And I was completely taken in by watching the mesmerizing up and down of the lift. But at between $169-199 that yellow iron is not in my price range. 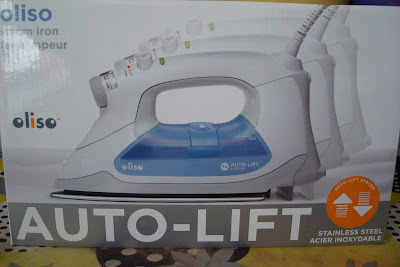 So I found this iron made by Oliso, too, with the same lift technology, and at a more affordable price. 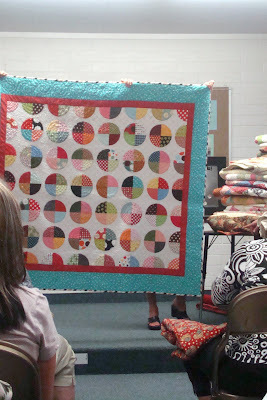 It arrived at my house a couple days before Quilt Market. I didn't have a chance to really try it out before that. 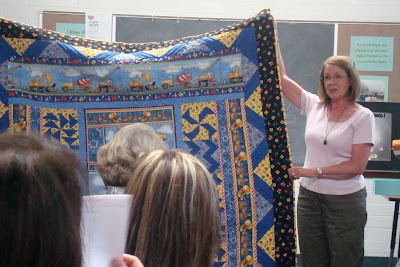 When I went to Quilt Market one of the booths I really wanted to visit was the Oliso booth to talk about what the difference was between a $50 blue Oliso and a nearly $200 yellow Oliso, other than the color. I was really disappointed in the sales pitch. The person was more interested in selling Lori the yellow iron than talking to me about advantages of Oliso irons over others on the market. The only thing I came away with was there are different hole placements where steam comes out in the different Oliso models and the sales person said that the blue Oliso steam would distort my quilt blocks. Hmmm. 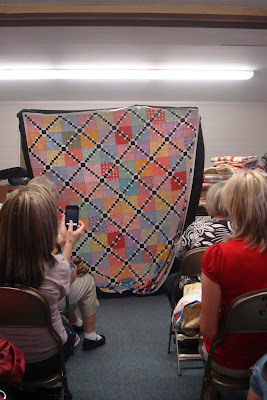 I will say when I iron quilt blocks or seams I don't hold my iron in one place so the holes/steam idea didn't really make sense to me. Maybe I iron completely wrong? I've been using the blue Oliso for about a month now. It is pretty good. It doesn't spit. The water well is nice and big (bigger than my last Rowenta) and I have to fill it less. I like the steam it generates. 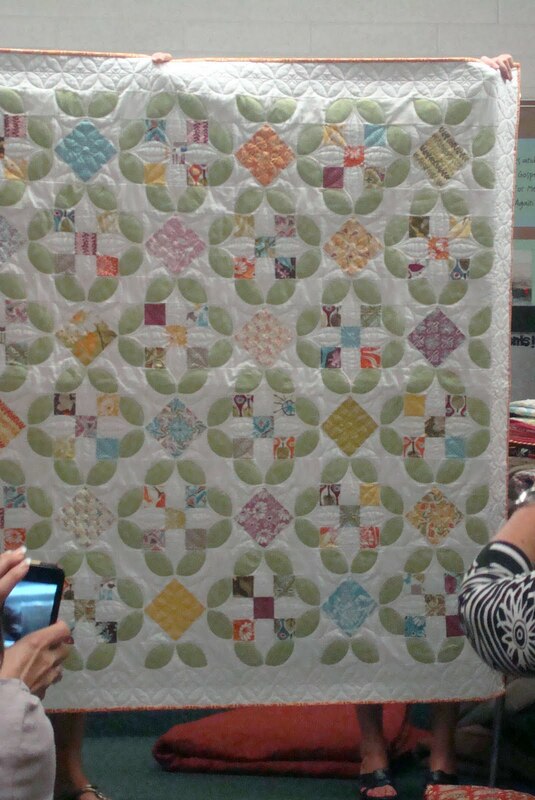 I do steam when I sew, even though I know some quilters say it is a no-no. 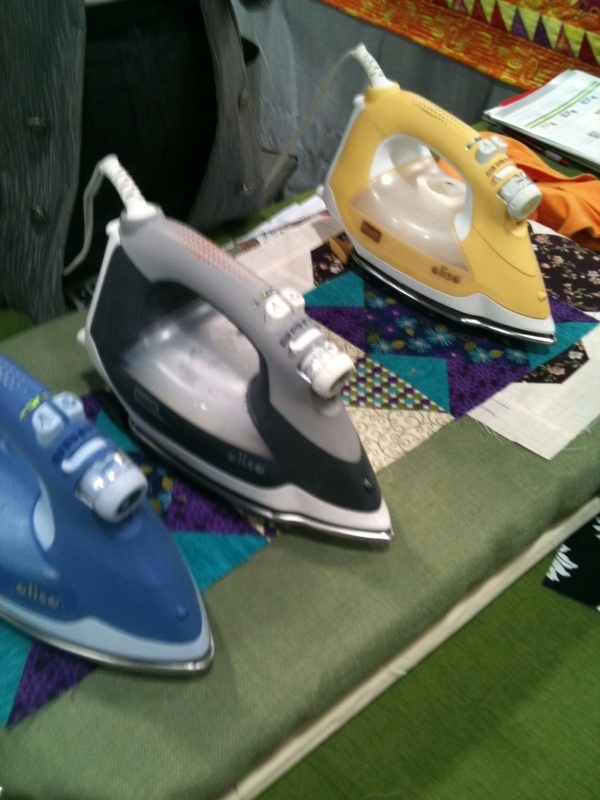 I would even say I like the feel of this iron and steam better than my last Rowenta. The iron heats up really fast. I like that a lot. Of course it auto turns off/on. I give it a 7.5/10. I'm not 100% sold on the lift idea/mechanism. The lift occurs when you take your hand off the handle. 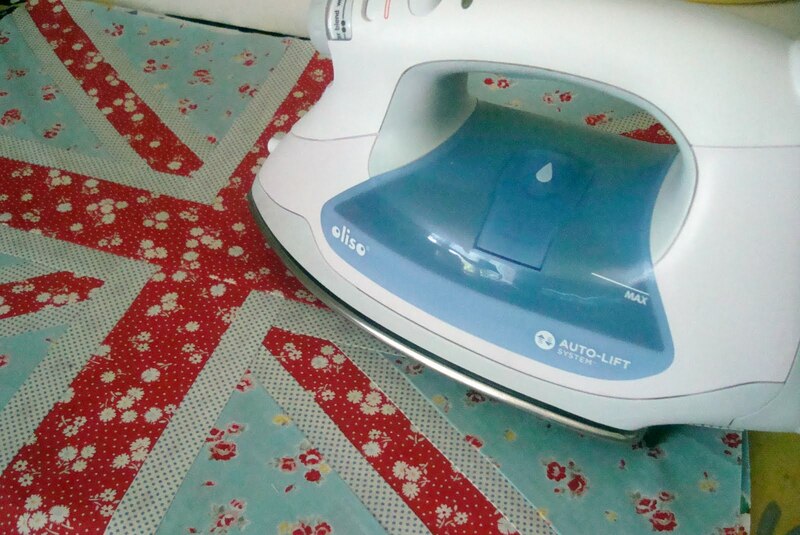 And if you are ironing a long chain of sewing blocks, it is really handy. But that said, there is a lag in when you put your hand on the iron handle and when the mechanism retracts. 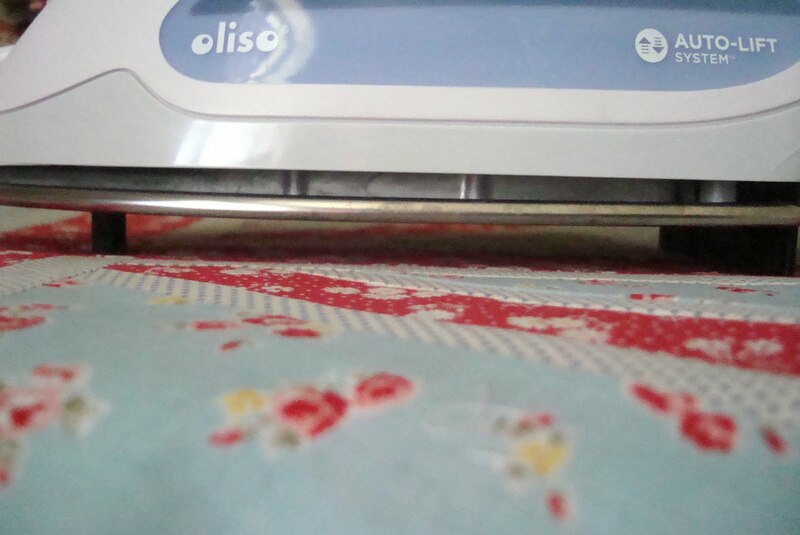 If you are a fast ironer, it can pull up the fabric into the mechanism. This has happened a couple times to me. But I am getting used to it. So I do like the iron on the whole but I like it at $50. I would not pay $169 or more for the yellow color and the holes for steam positioned differently. But that's just me. Maybe someone else thinks it is worth it? Recently I made 4 napkins out of a homespun type fabric and some beautiful premade crochet edged seam binding. It required a lot of ironing/pressing. It would be nice to disengage the lift mechanism working on a project like this with a fragile edge. However, it turned out well. I love little projects like this napkin project above. If I had to do it over again, I think I would still choose the blue Oliso. I think the pros outweigh the cons at the lower price. Am I too picky?